Note: Following the publication of the paper by Ovadia et al (2019), this guideline will be revised to take account of the findings of that research. 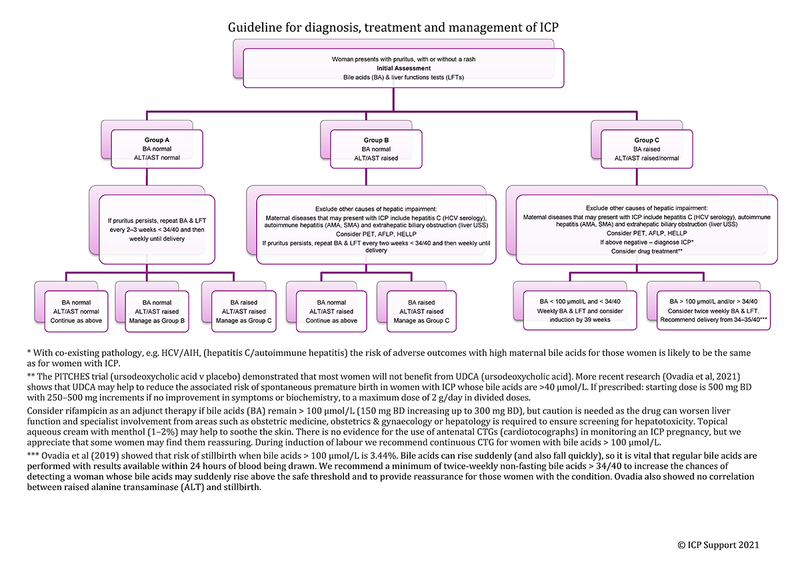 We recognise that whilst research is still taking place, ICP remains a complex condition to treat and manage. The mechanism for fetal death has still to be proven (thought to be associated with bile acid levels), and the current choice of drug, UDCA, is currently under evaluation (https://www.npeu.ox.ac.uk/pitches). This makes producing a robust guideline on the condition challenging, so this protocol is a suggestion based on what is known from the research and on similar practice at hospitals in the UK (such as St Thomas’ Hospital London and Queen Charlotte’s and Chelsea Hospital London). Bile acids can rise suddenly and steeply, so it is vital that bile acid results are available within 24 hours of blood being drawn. No in-depth study has been made of women who progress beyond 38 weeks. Researchers still need to establish the mechanism for stillbirth (as mentioned above). The guideline has been approved by Professor Catherine Williamson (Maternal & Fetal Disease Group, King’s College London) and we welcome your feedback. Please send your comments to Jenny Chambers – jennychambers@icpsupport.org.